8x6 Shed, Offers & Deals, Who has the Best 8x6 Shed Right Now? 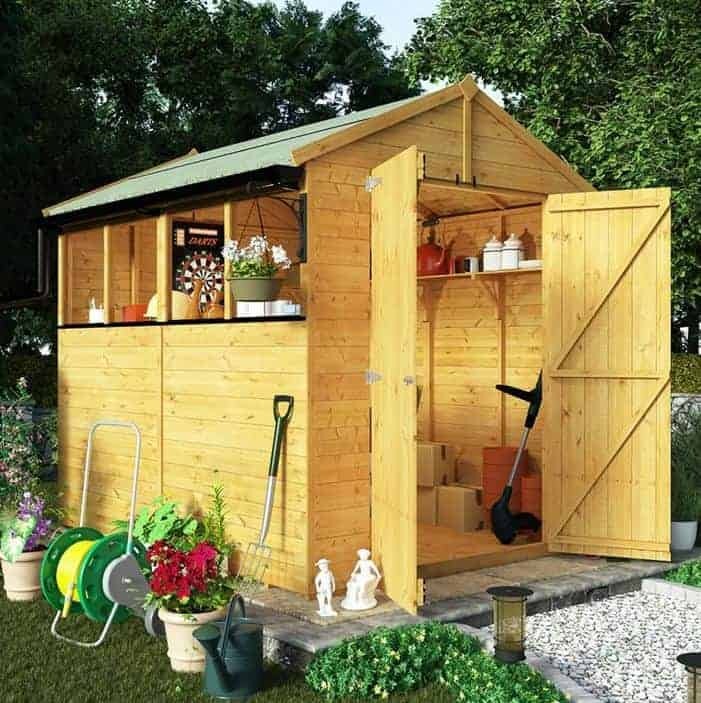 The 8×6 shed is one of the most practical garden buildings of them all, as its mid size design means that it can store a more than adequate amount of tools and equipment for a typical small garden and yet it won’t take up too much precious space. Because they are more compact they can typically be more affordable too, and the 8 x 6 wooden sheds will be quicker and less expensive when it comes to retreatment time. That’s why they’re such a popular garden shed, which also means that there’s a wide range available to choose from in timber, metal, and plastic forms. Don’t worry, this handy WhatShed guide will help you find the 8 x 6 shed that’s perfect for you out of the 20 best that can be bought online in the UK today. With such a large amount of 8×6 sheds to choose from, whether made of wood, metal or plastic, selecting the 20 best was far from easy. When collating the list we considered many factors including price and value for money, additional features and warranty periods, durability and build quality, and of course how they look. You can be sure then that all the sheds on our list will make a good purchase, and are the very best 8×5 shed currently available to buy online in the UK. Well done to the Waltons Ultra Value Tongue And Groove Apex 8×6 Shed which takes the accolade of being the highest ranked 8 x 6 shed in what has been a very competitive category. 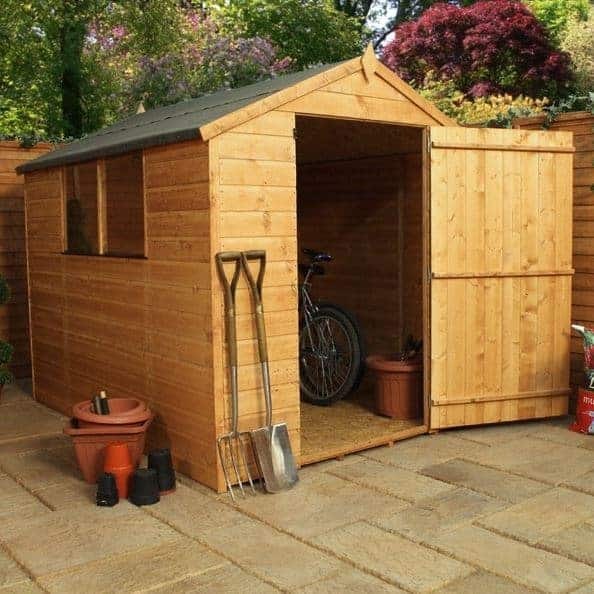 It’s low price and generous warranty period proved impossible to beat, but there are sheds in our league table to suit all styles and all budgets. Whether you want a medium sized garden shed, a child’s playhouse, or a large PVC workshop, WhatShed will continue to bring you the reviews that can help you make a perfect choice every time. This 8 x 6 shed may lack some of the additional features and grand styling of many of its competitors that surround it in the upper reaches of this WhatShed league table, but it makes up for that by offering excellent value for money for what is a very well constructed and reliable shed. Whilst the roof and floor are both made of solid sheet material, a cost effective option that enables such an affordable price to be offered to the customer, the walls are made of 12mm tongue and groove cladding, and it was good to see that the cladding is protected by a 10 year anti-rot guarantee even though this is reliant upon the customer carrying out annual preservative retreatments. The OSB floor is itself slightly thicker than the felt covered roof, and it also has integrated joists. This is very important as it protects the potentially vulnerable flooring from the threat of ground moisture. A threat of a different kind is also thought of, as the window free design means that the shed is less likely to be targeted by opportune thieves as they won’t be able to see what’s stored within. 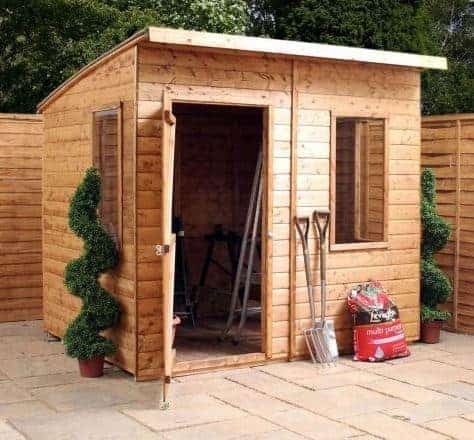 With the addition of a padlock, which can be bought at the same time as the shed for a price of less than ten pounds, we feel this could be a very secure 8 x 6 shed as well as a great value one. A very deserving shed that takes our coveted number one spot! We always rate value for money highly, but you’ll find an 8 x 6 shed to suit every budget in this run down of the 20 best. The runner up position goes to the second cheapest shed on our list, but it isn’t simply its price alone that takes it to such a lofty height. 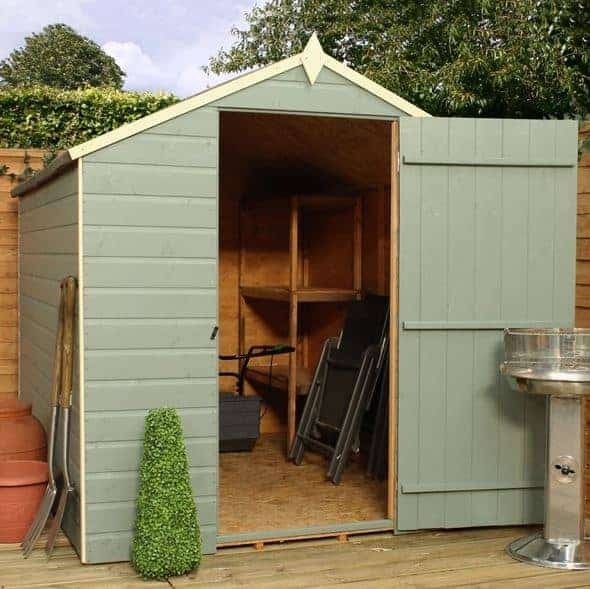 For a price of little over two hundred pounds this has a lot to offer the customer, especially those who like the traditional and rustic appearance of classic garden sheds. This shares that much loved look because it has overlap cladding, yet whilst that means that it’s not as thick or strong as the tongue and groove sheds that we’ve reviewed, it still feels stable and reliable once assembled. What we especially liked about this shed is that it has been pressure treated, which means that it has long lasting protection against wet rot and insect attack. This certainly isn’t something that we usually see on overlap sheds at this price, and as well as giving added value it also means that the owner won’t have to spend time treating it with their own preservative on an annual basis. At the top is a felt covered apex roof, and while there are no windows that in itself can be a security boost as it keeps prying eyes out. 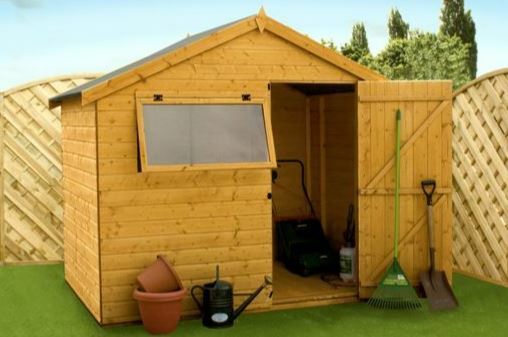 All in all, then, this is the best value 8 x 6 shed we’ve reviewed. This is the second metal shed to make our top three, but from a distance you could be mistaken for thinking that this particular 8 x 6 shed is made from metal. That’s because the metal cladding has been painted in a mid brown colour which has then been arranged in a shiplap fashion. This is not only very effective at keeping rainwater out, in which task it’s helped by the apex roof which reaches up to a peak height of 2.15m, but we also found it very eye catching and it could easily become a garden feature. In common with all the galvanised steel sheds we review it’s very durable, and in this case we were pleased to see that it was backed up by a 12 year cladding guarantee. We wouldn’t be surprised, however, to see it last much longer than that without any perforations appearing because of rust. 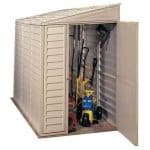 One thing that makes this metal shed stand out is that it comes with a strong and easy to assemble floor support kit. This means that a wooden floor can easily be installed, and as it will be raised up from the surface there’s built in protection from ground moisture. It’s a welcome addition and this price, and claims this shed the number three 8 x 6 shed spot in our league table. Log burning stoves are becoming increasingly popular as a greener way to heat the home, and potentially a way to save on household bills as well. To make the most of them, however, you need to have a plentiful supply of logs and firewood to hand, and that’s where this garden building can prove very useful. It’s not just a well built and attractive 8 x 6 shed, it also has an integrated log store that is protected from the rain by an overhanging apex roof, but which still has an open front to provide the ventilation that logs need if they’re to be effective as fuel. As well as this value adding feature, we were also impressed with the durability of the main body of the shed itself. Tongue and groove cladding is used throughout, including the floor which isn’t something that we always see on an 8 x 6 shed, and we were pleased to find that toughened glass had been used for the windows. It was also good to see that the timber had been pressure treated and that it therefore came with a 15 year warranty, which is another reason that this versatile shed features so highly in our league table of the very best 8 x 6 shed that can be purchased online today. While a metal shed may not be the first thing you consider when looking for a 8 X 6 shed, the 8 X 6 Lotus Heritage Green Shed we think you will agree offers many advantages over a wooden shed of a similar size. First of all the cream and green design of the shed gives it a very smart and industrial look. It is very modern and will certainly capture the attention of anyone who is in your garden. Made with strong galvanised steel, you will never have to worry about treating the shed. It is very low maintenance. Plus you also will never have to be concerned about any kind of rot or decay appearing on the shed. The walls along with the roof simply offer no way at all for rain to get inside the shed. Anything that you place inside of here will be kept safe and dry from the elements. Those large double doors look fantastic, but they also make it very easy to get things in and out of the shed. Even things as large as a bike or a big lawnmower will fit through these doors with ease. The asking price for this shed is very low and this is a major reason as to why this shed features so highly on our top 20 8 X 6 sheds list. This is the highest placed plastic 8 x 6 shed in our league table, and it earns its position by representing perfectly the advantages that PVC can bring as a substrate for garden buildings. Firstly, it is very tough and durable and as it can’t rot or rust, and isn’t prone to insect or rodent attack, it’s virtually maintenance free. 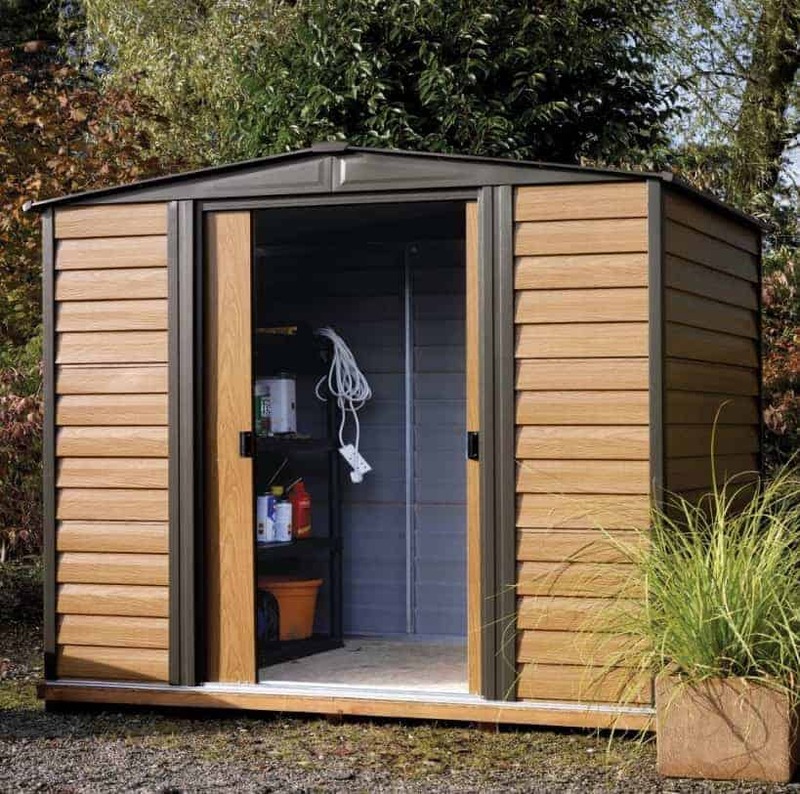 This makes it an ideal choice for people who simply want to install their shed and then forget about it, and whilst the 10 year warranty it comes with is less than on many plastic sheds we review, we don’t feel this is anything to worry about as it’s likely to last much longer without any problems occurring. Appearance wise, it shares the style of a typical apex timber shed with wide opening double doors, but we were impressed by its subtle grey colour scheme that makes it look surprisingly stylish. The floor is made of special anti-slip polycarbonate which makes for a safer interior, and we liked the way that the interior is well illuminated as well thanks to an integrated skylight in the roof. That means this shed has the benefits of a window free design for security purposes yet still has plenty of natural light inside as well, and it’s this highly useful combination at an affordable price which makes this our favourite plastic 8 x 6 shed. 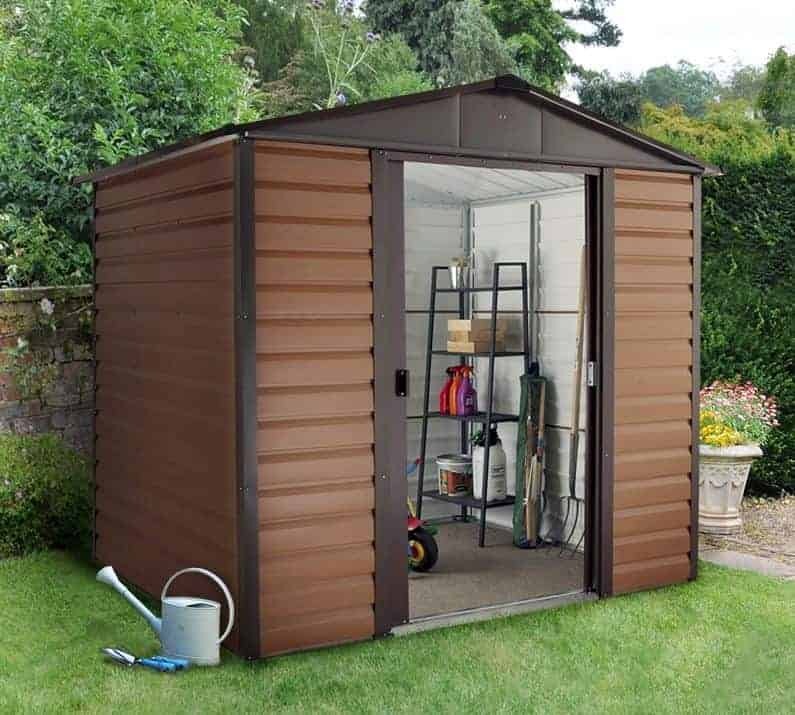 There are many factors that influence where a shed is positioned within our league table of the 20 best 8 x 6 sheds, which is why we’ve already seen examples that exhibit very useful additional features or which provide outstanding value for money. 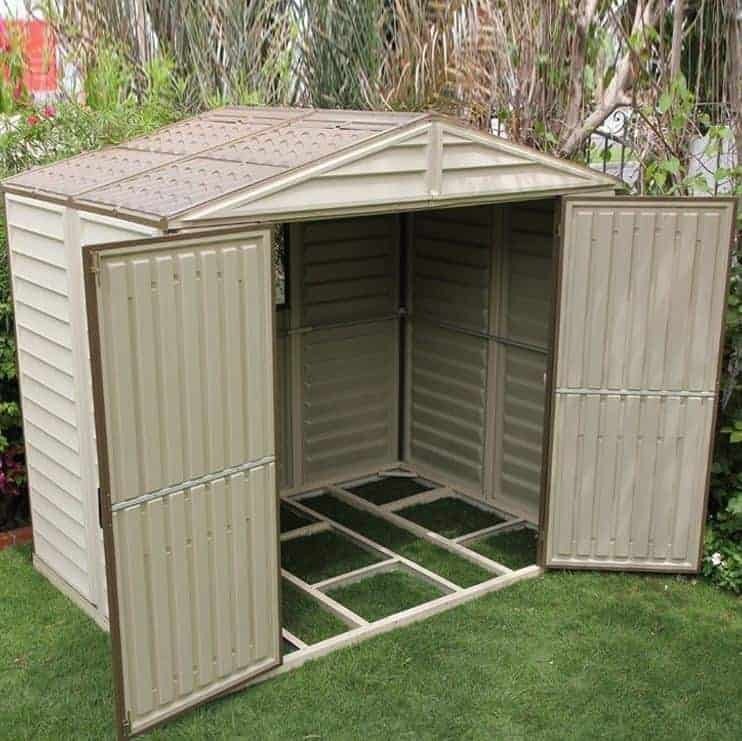 This particular 8 x 6 shed, however, gains a place within the top 10 thanks in a large part to its unique good looks as well as its practicality and durability. We were impressed by this shed at first sight, as the curved roof and long side windows give it a style of its very own, and we can imagine this fitting in perfectly with a modern home that has a lot of contemporary design features. The curved roof looks different to any other roof, but it performs just as well as the pent roofs we often see when it comes to carrying rainwater away. As tightly interlocking tongue and groove cladding is also used throughout, you can be confident that whatever is stored inside this 8 x 6 shed is kept dry, whatever the weather. The cladding itself carries a 10 year guarantee as well, and whilst this is reliant upon the customer applying yearly coatings of preservatives this needn’t be too time consuming a task on a mid sized garden shed such as this. 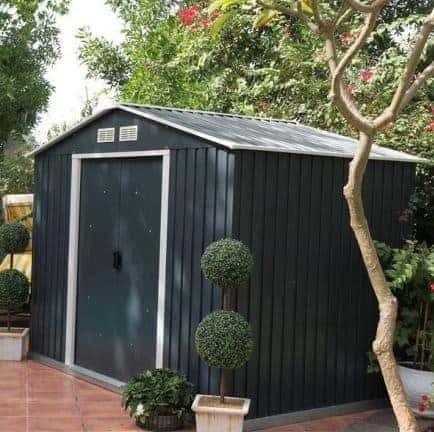 The majority of metal sheds that we see in all sizes are either a variation of silver, which is good for those who like a clean modern look for their garden buildings, or green, which is ideal for consumers who want a shed that will blend into a garden background. We always like to see sheds that stand out stylistically however, as long as they are aesthetically pleasing as well, and that’s certainly the case here. This metal shed has a dark grey, almost black, anthracite coloured cladding with white trim around the double doors and the air vents in the gables. It’s very striking, and a colour scheme that we haven’t seen used on an 8 x 6 shed from any other manufacturer. It’s not only the paintwork that attracted us to this shed however, as the hot dipped galvanised cladding makes it very tough and durable as shown by the 15 year non perforation guarantee provided by Emerald. Another feature that we welcomed is the integrated entrance and exit ramp, and because of the non-flammable nature of the metal substrate we can imagine this being used as a place to store motorcycles all year round, as well as acting as a secure, window free and spacious 8 x 6 shed. This is a shed that we had to put on our top 20 list! It may be one of the more pricey sheds in the 8 X 6 range, but it is also one that is made with the finest materials. 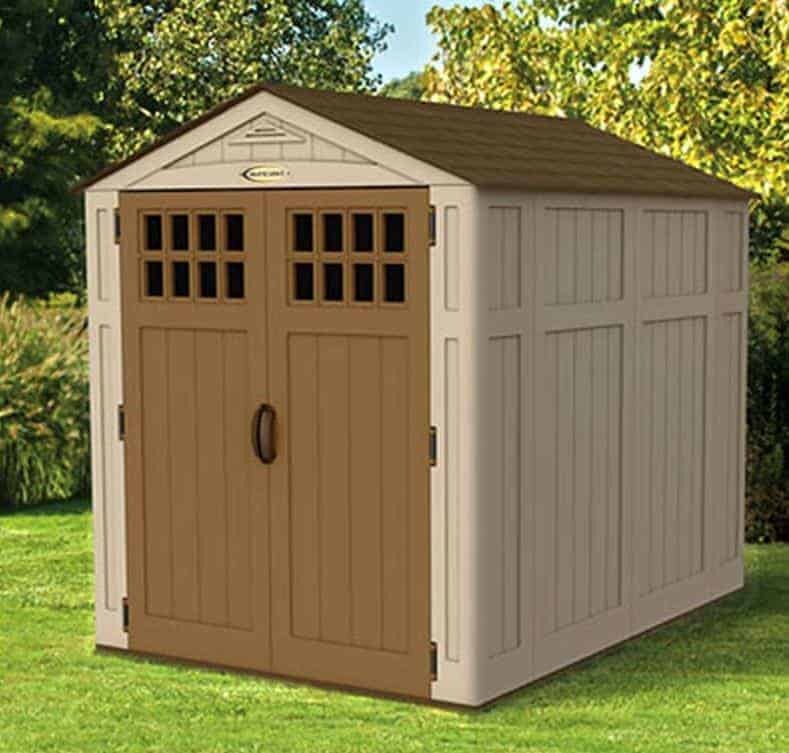 The high quality polypropylene that has been used to make this shed does not rot, crack, age or require any upkeep from you at all. This is a very low maintenance shed and once installed it asks nothing from you, except to keep the doors closed. The included windows and the air vents mean that it will be nice and comfortable inside. This is clearly a fantastic looking 8 X 6 shed, but it is also one of the most stylish on this list. The wooden effect of the polypropylene looks incredible and will have many people asking if it is actually wood. The shed has been finished off with a very smart looking white trim and a slate looking roof to really give it some modern style. 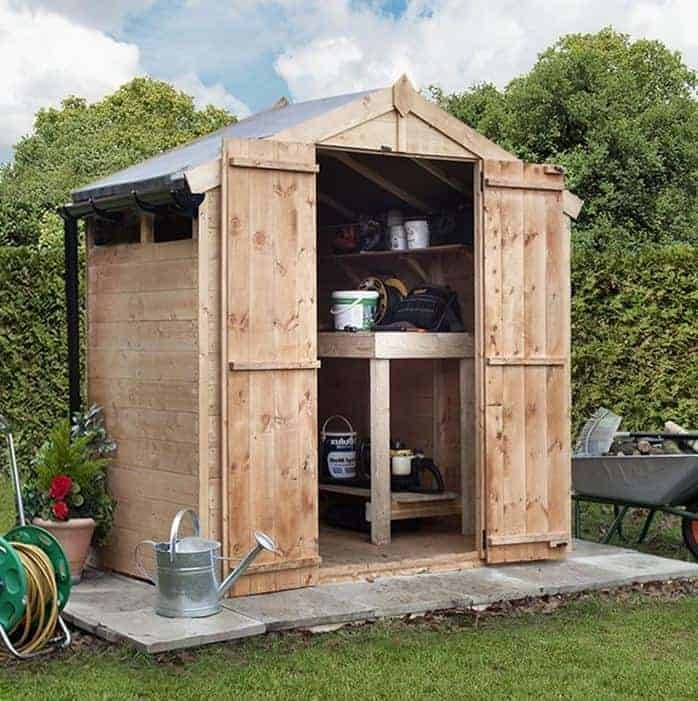 This is certainly a shed that is going to be a stand out feature in your garden as well as being a place to keep items safe. The top ten of our list of the 20 best 8 x 6 sheds available online in the UK today is rounded off with the most expensive entry on the list, but it has so many positive features that it is only the thousand pound price tag which stops it achieving a much higher position. It’s not the only 8 x 6 shed to be made of hot dipped galvanised steel on this list, of course, yet it still achieves a unique look as the metal has then been given a dark green PVC coating. 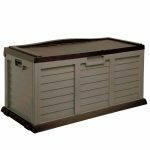 This not only gives it a very attractive appearance, it also adds an extra protective layer making this shed rot and rust resistant, as well as being fire resistant to class 0 and 1. When you spend this much on an 8 x 6 shed you’ll want to be sure that it’s going to last, which is why we were pleased to see that this reassurance was given in the form of a long 25 year warranty. That’s as long as any that we’ve seen provided with a shed of this size, and means that you get a quarter of a century’s worth of peace of mind. It also features one acrylic window underneath the apex roof, and with built in ventilation the interior is light and airy. A secure key operated lock is also provided, which is another reason that this could be your number one choice if its price falls within your budget. BillyOh make a wide range of timber sheds in all sizes, but thanks to its clever design and a very affordable price tag this is their 8 x 6 shed that we rate the highest. At first glance it looks like a typical apex roofed shed but then we noticed the four tiny windows on the side panel. Positioned just underneath the eaves they allow a decent supply of natural light to reach the interior, which always creates a more pleasant environment to spend any length of time in, but they still mean that it’s virtually impossible for passers by to find out if anything of value is kept inside the shed, which we feel makes it much less likely that it will be targeted by an opportune thief. Another feature we liked was the tall double doors, which have an opening height of 1.68m. This makes it very easy to move tall objects in and out, and once inside they’re protected from the elements not only by the apex roof but by the tongue and groove cladding which is protected by a 10 year guarantee. 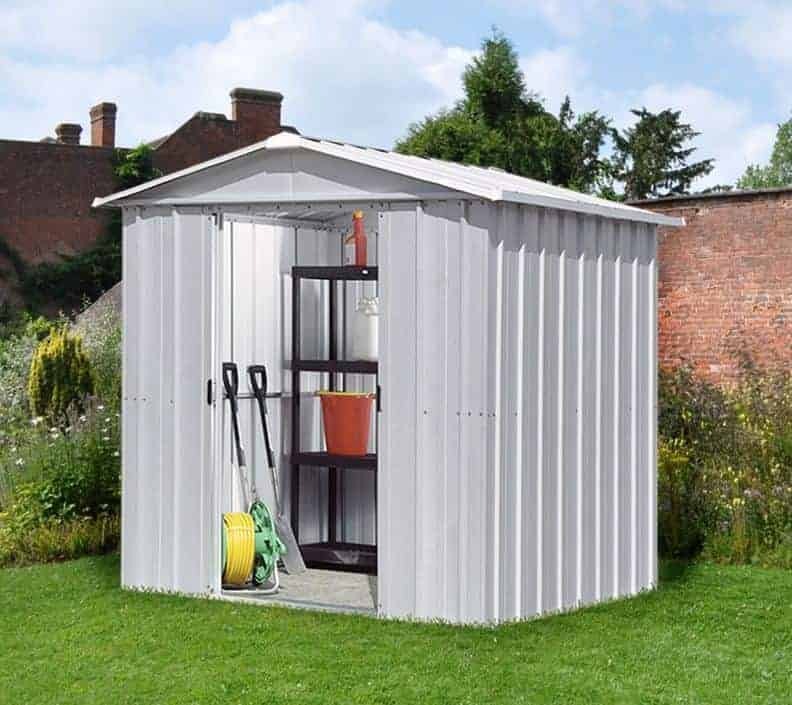 In common with the other sheds in this range there is no floor included as standard, but one can be added for as little as £42 so we still believe this is a good value 8 x 6 shed and one that deserves its place in our league table. If you want a metal shed, with all the practical benefits that brings in terms of strength and maintenance requirements, that has the appearance of a wooden shed then this could be an ideal choice for you. Whilst up close its metal origin is unmistakable at a distance it has the look of a traditional timber garden building topped with an apex roof thanks to its brown colour scheme arranged in an overlap style. This then is not only a very attractive metal 8 x 6 shed, it’s also one that’s very practical and good at keeping rainwater or even snow out. All fixtures and fittings are included, so it’s quick and easy to construct, and once assembled it feels very strong and sturdy despite the lightweight nature of its cladding. It comes complete with a 10 year guarantee against perforations caused by rust, but as the quality of materials seems to be high we wouldn’t be surprised to see it lasting much longer than this warranty period suggests. 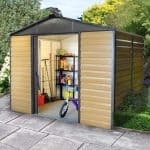 If you want a metal 8 x 6 shed that’s attractive, with sliding double doors to make it easy to store and retrieve items, at a price of less than four hundred pounds then this is well worth your consideration. 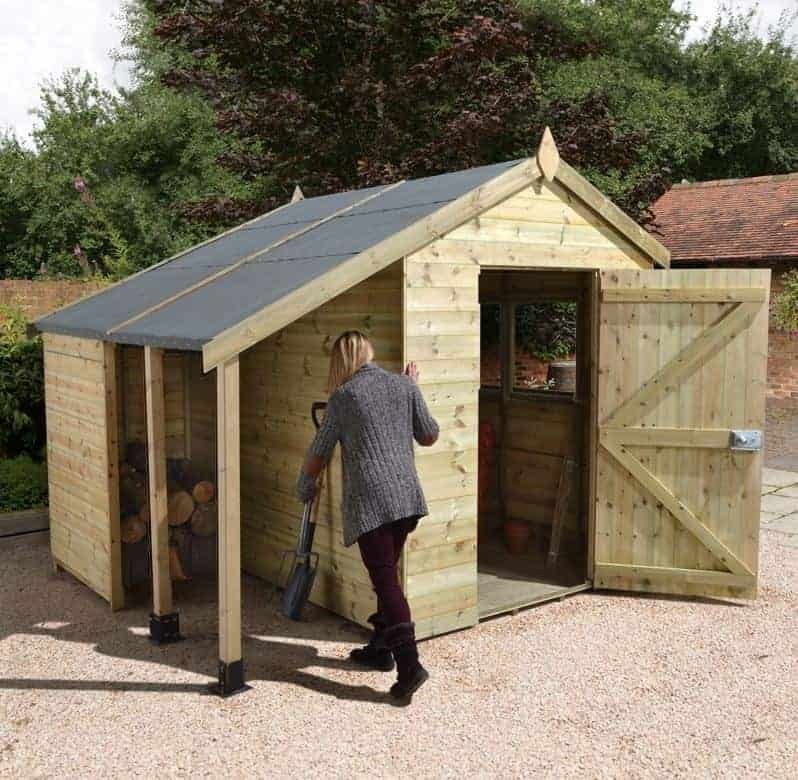 This strong and reliable 8 x 6 shed has the traditional look that we all love in garden buildings, with an apex roof that quickly channels water away being positioned above smooth and tough tongue and groove cladding. Being well manufactured, the cladding locks tightly together so that there are no gaps for water to penetrate into. This cladding is also covered by a 10 year guarantee which we would expect with a shed of this price, even though we would have preferred to see it come with a longer warranty and to have had an initial pressure treatment rather than the less enduring dip treatment used here. There are two stand out features which raise this 8 x 6 shed above its competitors and elevate it into our list of the 20 best. Firstly, whilst it has a single hinged door rather than double doors, it is both wider and higher than most single doors that we see, with dimensions of 0.88m and 1.66m respectively. The other thing which really impressed us at this price is that the tongue and groove cladding on the walls is 14mm thick rather than the 12 that we usually see. This extra 2mm can make a noticeable difference when it comes to strength and stability, and is a very welcome addition to such a good value mid sized shed. This is the top end model from the BillyOh range, and yet it still represents good value for money for such an attractive timber 8 x 6 shed. It is only the lack of a floor as standard which prevents it being placed higher up our league table, and whilst some owners may elect to screw it directly into an area of level concrete we feel that most will pay a little extra to add either a solid sheet or tongue and groove floor to their purchase. The tongue and groove cladding used for the walls, which is covered by a 10 year anti-rot guarantee, is thicker than that used on other sheds from the same manufacturer, as is the frame. The result of this is an 8 x 6 shed that feels stable and reliable from the moment it’s assembled. We also liked the bank of four fixed windows which dominate one side of the shed. They allow a lot of natural light to reach the interior and yet because they only occupy the upper third of the panel it’s still possible to keep valuable items out of sight of people passing by. In this way this can still be a secure environment for any valuable gardening equipment, particularly if a padlock is added to the pad bolt that’s supplied as standard. This is the most traditional looking metal 8 x 6 shed thanks to its stark silver colour scheme, which is one of the reasons that it isn’t placed higher up our WhatShed league table. Nevertheless it has a lot to recommend it, and we even liked its modern contemporary appearance, although we know not everyone will agree. What can be universally agreed upon however is the fantastic value for money that this shed provides; it’s cheaper than any of the other 8 x 6 sheds on our list and being made of galvanised steel there won’t be any additional expenses to come in further years in the shape of wood preserver needed for retreatment. To add to this value for money a 10 year cladding guarantee is provided by Yardmaster, and an anchor kit is included as well to secure the building itself to a suitably sized level area of concrete or patio. We were pleased to see this, as an anchor kit isn’t always included as standard with a metal 8 x 6 shed at such a low price. 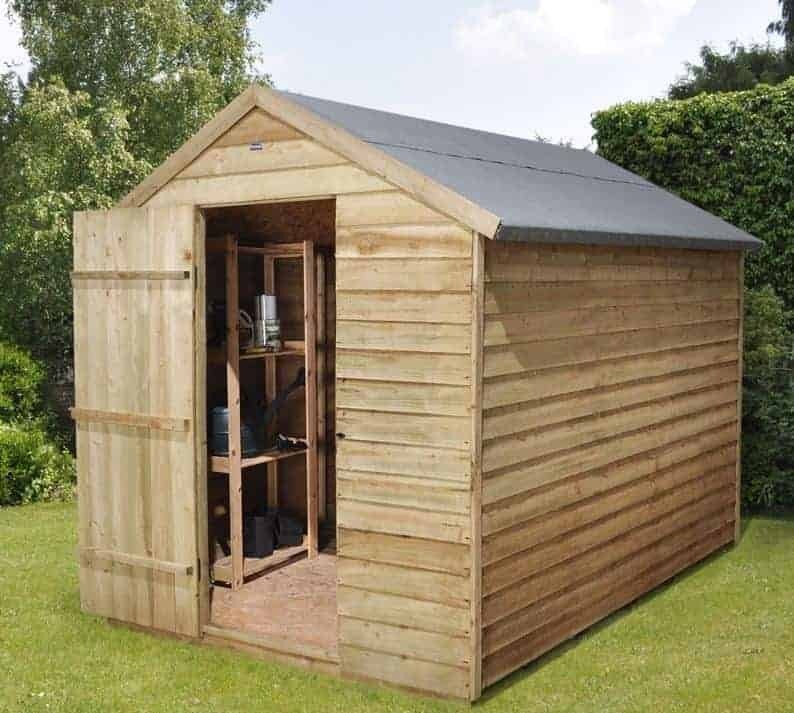 On the downside this is one of the shorter eight foot by six foot sheds that we’ve seen, with the apex roof giving a ridge height of 1.89m and an eaves height of 1.63, but if you’re looking for a low cost shed that is maintenance free as well this one is hard to beat. Some people want a shed that is easy on the wallet, easy on the eyes and just does its job. 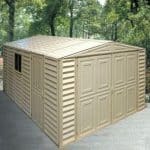 That is exactly what you are getting with The 8 X 6 Reverse Apex Overlap Wooden Shed. This is being sold for a great price and some may argue that this alone should have bumped it up a couple of spots on our top 20 list. Of course the price alone is not the only reason that this shed has made it onto this list. We genuinely feel that this is an impressive 8 X 6 shed. It may not be as overly high quality as some of the rest and a couple of corners have been cut, but they have done a great job in making sure that this is as high quality as it possibly can be at this price range. The overlap cladding has a very smart rough cut look to it which gives it a real hard working kind of look. The cladding may not be the thickest, but as it is backed up with a solid frame, this is still one very robust and long lasting shed. 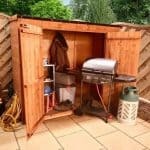 For just over £300, if you look after this shed just right then you will be able to get great use out of it. Some people often profess that they don’t like the appearance of a vinyl 8 x 6 shed compared to a traditional garden shed made of timber, but once they’ve tried it and seen the benefits for themselves they often become lifelong converts to the plastic cause. This Duramax shed with wide opening double doors is a perfect example of the genre, and the natural toughness of the cladding, not to mention its imperviousness to rot, rust and insect attack means that it comes with a value adding 15 year guarantee. Another advantage of this particular shed is that it has a modular design; this means that the white cladding sheets, arranged in a shiplappattern, come readily assembled and simply slot into place along a strong steel frame. 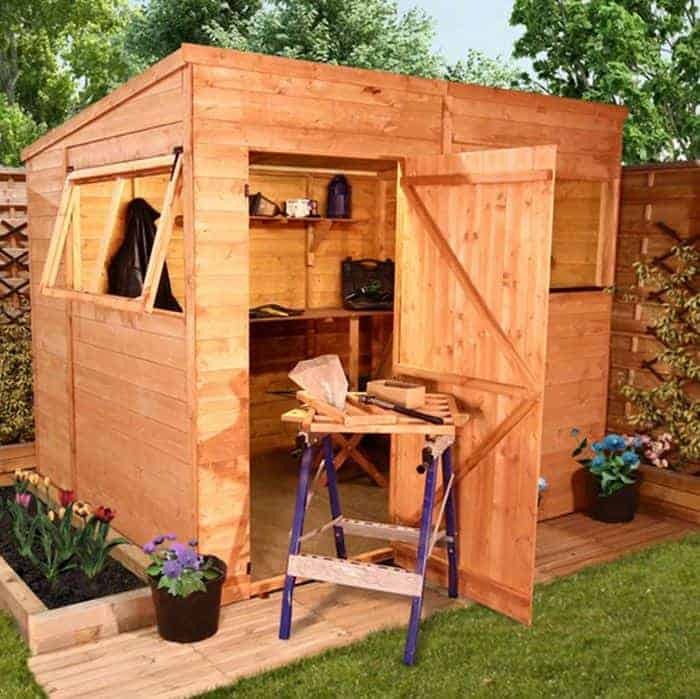 This can significantly cut down on the time it takes to assemble this 8 x 6 shed, particularly for those who aren’t DIY enthusiasts, and it also means that you won’t need to have a large selection of tools handy for the installation process. 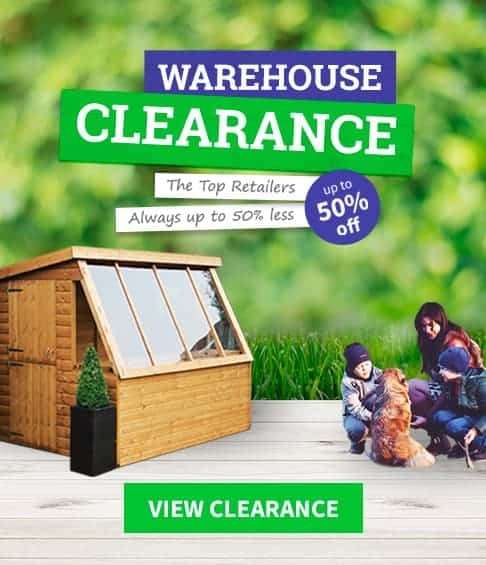 With so much to recommend it, it’s only its relatively high price compared to other plastic sheds of a similar price that prevents it being placed much higher up our league table of 8 x 6 sheds. This is the third 8 x 6 shed from the BillyOh range to feature in our top 20 league table, and yet this is the very different from its stable mates and indeed from all the other timber sheds that have made this list. That’s because it features a pent rather than apex roof, and this can make it particularly attractive to people who don’t want a shed that stands out too much either for stylistic or security purposes. The pitch of the roof still ensures that precipitation is quickly swept away, but its eaves height of 1.79m is a little lower than that on most of the sheds featuring within this guide. We were pleased to see that high grade tongue and groove cladding had been used throughout, and indeed that it comes with the reassurance of a 10 year guarantee. Another feature we liked is the inclusion of three windows, all of which are made of shatter resistant styrene which in itself can act as a boost to the shed’s security levels. Whilst two of the windows are fixed in position, one can be opened to provide a natural source of ventilation. This means that the interior of this 8 x 6 shed can be both light and cool on a sunny day. 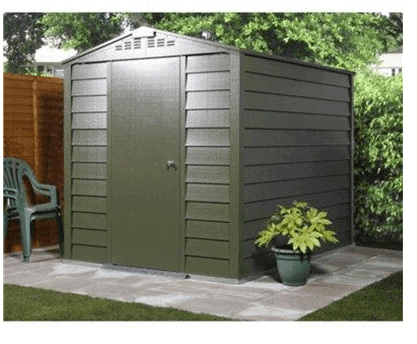 This is the second 8 x 6 shed on our list to feature a reverse apex orientation and again we would recommend this kind of shed to people who are looking for a spacious storage facility but whose lawns are considerably narrower than they are wide. We found this to be a very attractive shed as well, thanks to its traditional styling and the one wide opening window which is adjacent to the single hinged door. Because there are no windows on any other side, by careful positioning it may also be able to prevent unauthorised personnel from seeing inside, enhancing the shed’s security and creating a more private storage space. Interlocking shiplap cladding is used for both the reverse apex roof and the walls, although OSB sheeting is used for the floor. At this price, we would have liked to see tongue and groove cladding used throughout, and this is one of the reasons that this otherwise excellent and well built 8x 6 shed is near the bottom of our top 20 league table. On the plus side, it does come with a 10 year warranty against wet rot although this is dependent upon the owner adding a preservative treatment immediately after installation as well as annually thereafter. This plastic resin 8 x 6 shed may be at the foot of our top 20 league table, but that is no indication of its build quality or what it has to offer the customer. 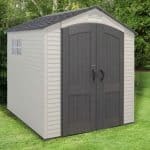 In fact, it’s only the relatively high price which makes it the second most expensive shed in our list, and the five year warranty which is easily the shortest offered on similarly sized plastic sheds that we’ve reviewed. As extra strong resin has been used to create blow moulded walls, we would certainly expect this shed to far outlast the warranty provided with it, and so if your budget will run to the asking price of nearly a thousand pounds as well then this could be the perfect mid sized shed for you. The cladding has an off white colour which the manufacturers refer to as sand, and the double doors and roof both have a dark chocolate brown colour. 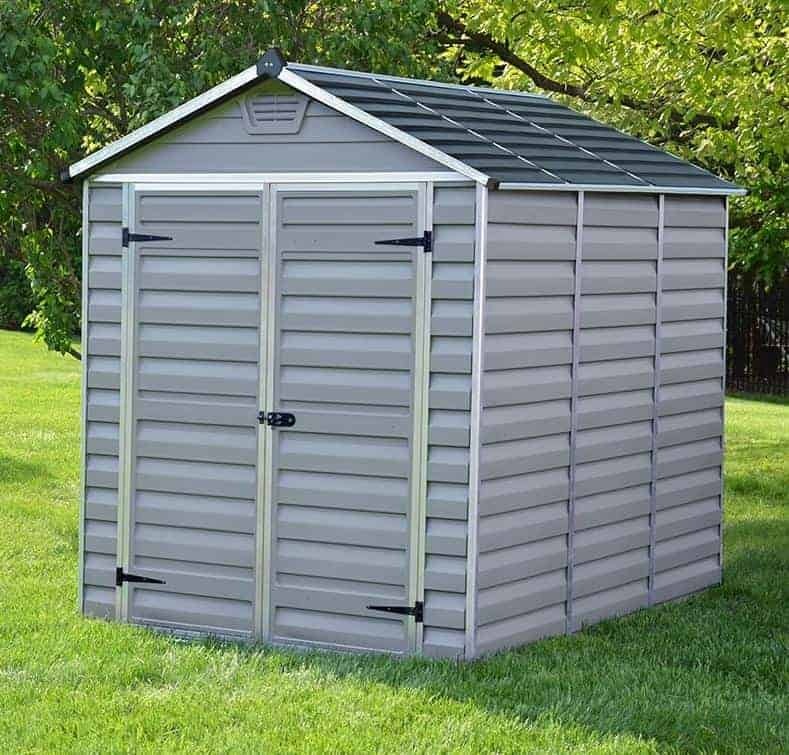 This apex roof is designed in a shingle pattern and has been reinforced with steel rods, and the floor too has been reinforced which makes it ideal if you plan to us this 8 x 6 shed to store heavy machinery or possibly a motorcycle inside. This also has the highest eaves of any of the sheds in this top 20, at 2.18m, and we were also impressed by the bank of tiny windows running across the top of the double doors. This then is a very tough shed with a lot to recommend it, even if it does have a price to match.